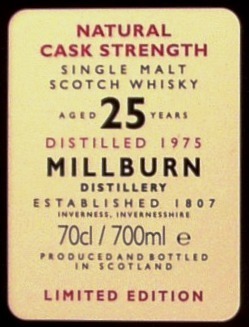 Closed in 1985, Millburn distillery was the first to be established in Inverness. Little or no single malt from Millburn was released during its lifetime, but there were some interesting Rare Malt versions in the mid-’90s and several independent bottlings have also appeared. The house style was full and occasionally smoky. Independent bottlings aren’t that difficult to find and if you know where to look you can find some excellent deals on some really good whiskies.